Hemos estado con media pensión, y genial, como siempre. Cierto que las habitaciones al menos la nuestra necesitan algo de reforma. Poca luz en general. El sofá-cama incómodo. Volveremos. 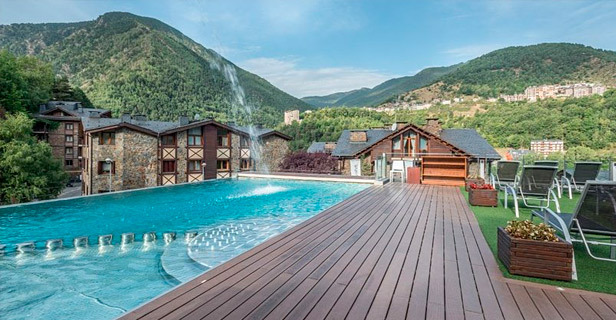 This resort is stunningly set in La Massana. The resort lies just 3 km away from the gondola station Ski Vall Nord. Guests can enjoy an extensive range of exciting activities in the area. This wonderful resort blends beautifully with its surroundings. The hotel comprises stunningly-designed suites, which feature a bedroom and a lounge area, as well as many amenities. The resort offers a wide selection of sporting, health and relaxation activities in the fitness club. Guests are invited to indulge in a wonderful buffet-style breakfast in the mornings, before setting off to explore this spectacular area. This hotel is classed as a "bikefriendly" hotel and welcomes cyclists from all over the world. The hotel boasts facilities to support both the leisure and professional cyclist. Type: Hotel, Business Hotels, Hotels With Spa. ** The Spa is closed. Aqua fit, Banana boating, Table tennis, Squash, Aerobics, Fitness, Billiards, Tennis (*), Paddle tennis (*), Skiing (*). Services: Breakfast, Breakfast buffet, Set menu lunch, Buffet dinner, À la carte dinner, Half Board, Picnic, Snacks. Bathroom, Hairdryer, Toiletries, Make-up mirror, Free WiFi, Direct dial telephone, TV, Hi-fi, Microwave, Central heating. Check in:16:00 hrs. 23:45 hrs.